Charles McCallon Alexander (1867 - 1920) was born in E. Tennessee. He studied music at Maryville University and eventually became a Professor of Music. He attended Moody Bible Institute 1892 - 1894, then toured with the M. B. Williams revival campaign. 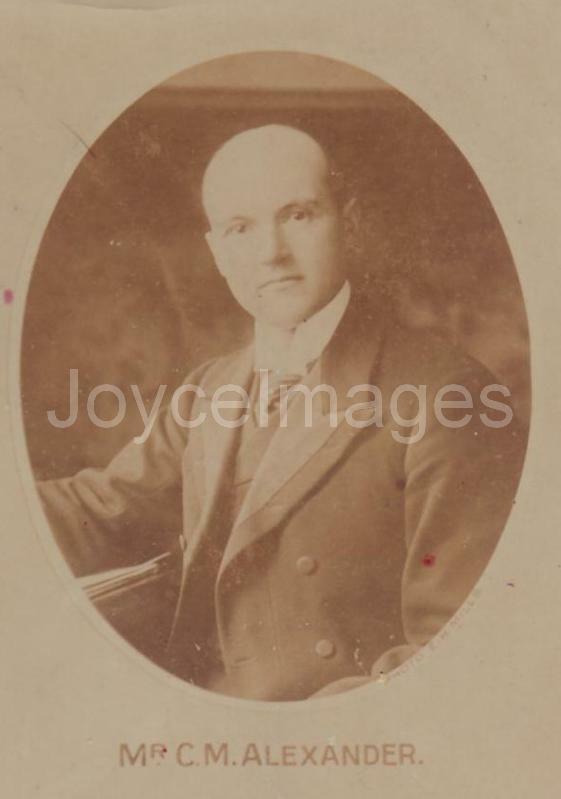 Between 1902 and 1906, he joined the evangelical tours of Dr. R. A. Torrey. In 1904, he married Helen Cadbury (daughter of the Cadbury Chocolate Company president) and she joined the tours as a women's worker. In 1907, Alexander launched with evangelist John Wilbur Chapman the 'Chapman-Alexander Simultaneous Campaign.' They assembled a team of evangelists and songleaders and held their first campaign in Philadelphia (March 12 to April 19, 1908): they partitioned the city into 42 sections covered by 21 evangelist-musicians teams, and had some 8000 conversions. Other campaigns followed in Vancouver, British Columbia, Australia, and the Far East. By the end of 1910 however, Chapman's 'mass evangelism' technique was losing favor in evangelistic circles. By 1912, Chapman and Alexander were back to large meeting revivals. Their last revival tour ended in February 1918. Alexander then retired to England. He is interred in Lodge Hill Cemetery in Birmingham.